When asked about the Origin of Species and the theory of natural selection, Thomas Henry Huxley told friends, “how extremely stupid not to have thought of that”. This is well-known folklore, and much has been made of it. Though often repeated, it rarely is traced to its source and considered in its full frame. Just where did Huxley say this, and what’s the original context? Source: Huxley, Thomas Henry. 1887. 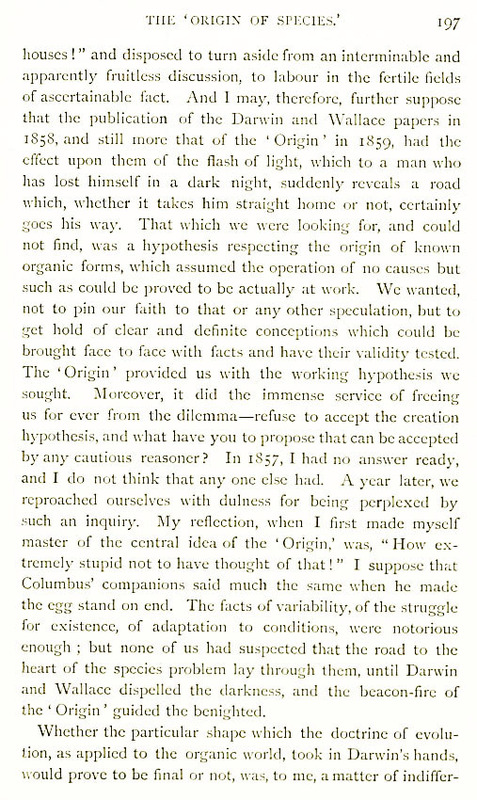 On the Reception of the ‘Origin of Species,’ in Darwin, Francis (ed.). 1887. The Life and Letters of Charles Darwin, Including an Autobiographical Chapter (London: John Murray), volume 2, pp. 179-204. Quote is on v2:p197. Was this the original usage? In the Preface to volume 1 of The Life and Letters of Charles Darwin, Francis Darwin (pp. v-vi) implies Huxley wrote this essay specifically for inclusion in this volume. Huxley might have told this story before, but I’ve not located any reference to an earlier usage. A search of the digital volumes in The Huxley Files (Web) reveals no earlier version in print. However, this collection is not exhaustive. The Huxley Files was created by Charles Blinderman and David Joyce (Clark University). Huxley, Leonard (ed.). 1900. Life and Letters of Thomas Henry Huxley (London: Macmillan and Co.), volume 1, pp. 167-171. The ‘extremely stupid’ quote is on page 170. As the volume above makes clear, this is an extract from Life and Letters of Charles Darwin, volume 2, pages 187-190 and 195-197. Where is the Famous Piltdown Man Excavation Site, East Sussex, England?